The spectacle recounts the biography of Walter Gropius, a Bauhaus architect, whose idea was to influence social change. In the interpretation of the Otwock Commune, Gropius, choosing personal happiness in life, his own fulfillment and “the normal” work of an architect opted for the pleasure principle. This is an example of reverse, non-revolutionary change – from a great idea to normal life, illustrated with precise, balanced, peaceful dance – art scenes maintained in a Japanese– Bauhaus-like style. The spectacle is accompanied by live music and a slide show projected on a huge fan-like screen. The spectacle, whose length is measured with the pouring of small, white stones to make a road, is divided into stations. The text, projected at the beginning of each of these on the lowered fan-like screen, is presented by members of the group by means of a repeated sequence of movements. Walter Gropius as a personality was required only as a springboard for ideas. The premises of the Bauhaus may provoke discussion relating to the role of art the conflict between creativity and being of service, originality and functionality (in the case of architectural designs and applied art). The Commune goes beyond this, making a spectacle which is not only a reflection on the tasks art is to fulfill (although Design/Gropius can be interpreted from this point of view as well), but also about the lack of sensitivity (escaping from the “trembling of the body”), about conformity, people’s tendency to draw toward an illusion of security and welfare, their aiming to peacefully settle down. Design/ Gropius is the story of the failure of ideas and the end of faith in the possibility of changing the world (hence the subtitle of the performance Why There Will Be No Revolution). The concept of “performing arts” does not exist in the Polish language. We have different divisions. We divide art into the theatre, visual arts, installations, happenings. The Otwock Commune is on the border of all of these. 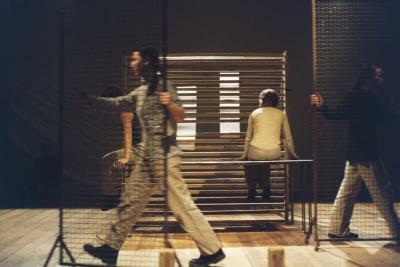 In its performances they consistently build a theatre in which the visual sign is mixed with the actors’ intense energy. Usually the results are very good. It breaks the boundary of the stage, goes out into the audience. I think that in this spectacle this process was deliberately curbed.